Rustin Cohle: Surname pronounced like “coal.” Both his first and last names are not only colors, but elements. Rust (his nickname) invokes decay, change. Coal is black, dirty. When we first see Rust being interviewed he is weathered, smoking, drinking and in a state of decay. It’s a stark contrast to the flashbacks when we see him as a vibrant and clean working detective. Martin Hart: Martin comes from the Roman god Mars, the god of war. A very powerful name. Although his surname has obvious connotations, Marty is not the heart of the detective duo. In fact, he is the antithesis of heart: he cheats on his wife, physically abuses his daughter and is violent towards others whom he has judged or who have crossed him. As horrid as his behavior is, he portrays a man who has had his heart broken. By his wife, his daughter, “the job” and his partner. Maynard Gilbough: Maynard is a French surname from a Germanic root, meaning “strong and brave.” Gilbough, as analyzed by one Reddit contributor, means “Golden Bough.” Colors have great meaning in this story. Golden is another word for Yellow–a running theme–and there are boughs/sticks all over the place! Gilbough and his partner, Papania, are set up from the beginning as being opposites of C&H. They are corporate, suit-wearing, company men. They sit on the opposite side of the table. They are even opposite in color. However G&P have many similarities to C&H. Maynard and Martin are almost identical names in spelling, pronunciation and meaning. The writer wants you to know that in this duo, Maynard is the Martin. The leader, the elder. Thomas Papania: Papania is a rare Italian surname in the U.S., derived from the word “father” or “priest.” Since Papania is one of two detectives trying to get a confession, this is an apt name. Thomas means “twin” which is relevent, since he is one of a pair, just like Cohle and Hart. Papania is the “twin” of Cohle, who is known throughout the PD as the cop who gets the confessions. 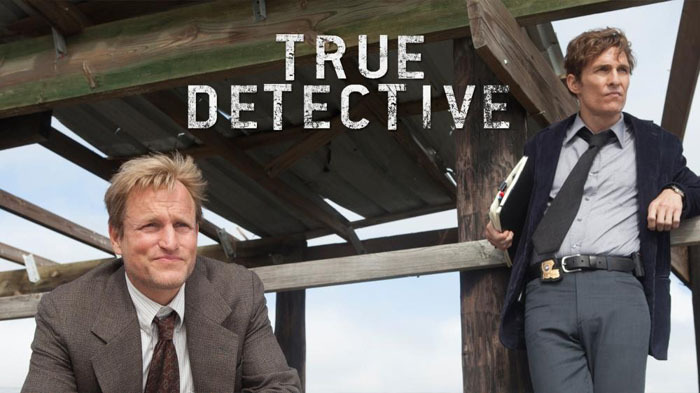 Dora Lange: Dora Lange is the first victim that Hart and Cohle investigate. I laughed when I first heard the name, because I chose Lange as a surname in my series of novels. Jonathan Lange is my hero detective’s deceased partner who talks to him beyond the grave. Figured it out, yet? Try anagramming! Marie Fontenot: Marie is the French form of the name Mary. In religious terms, Mary is most often thought of as a pure, virginal creature. However it is also the name of the prostitute, Mary Magdelene. This implies both purity and innocence, but also sexuality. Definitely the main theme of the crimes–sexual abuse against children. Fontenot comes from the French word for “fountain.” This particular victim opens up a font of information leading to the killer. Reanne Olivier: A woman who supposedly drowned, but whose body had severe abdominal lacerations. She had a cocktail of drugs in her system and the symbolic spiral drawn on her back. Reanne is a form of the Welsh name, Rhian/Rhiannon, which means Queen. We experience a lot of King/Crown imagery in this series, this is the first Queen. Kelly (Catatonic Victim): Another color name. Also: Dora Lange’s middle name was Kelly. Kelly is a shade of green and the color green means alive, verdant, thriving. Another name that is an antithesis to the character, like Hart. Billy Lee Tuttle: When Southern characters are given two first names, especially when the first is diminutive, we naturally think of a lower-class, backwoods type of upbringing. I call it “Billy Bob” naming. The creator even went so far as to use the cliched “Billy” name and pairing it with a silly-sounding last name like Tuttle. According to Ancestry.com, the Tuttle surname comes from the Scandinavian god THOR + KETILL, meaning “a cauldron.” This name denotes both power and occult themes. DeWall Ledoux: DeWall was literally “the wall” between the detectives and Reggie, who was their main suspect. He led them back to the meth house, where they eventually found Reggie (and two victims). Tyrone Weems: The name Weems is derived from the Gaelic word uamh, meaning “cave.” We meet Tyrone in his prison cell, which is most like a modern cave. Weems also sounds like the words “worm” and “squeemish” giving a sort of underbelly connotation.